In 1951, during the Korean War, Canada was faced with a shortage of nickel, which had traditionally been used in producing the five-cent piece. To deal with this problem, the Royal Canadian Mint reverted to a solution which had been found during the Second World War. It struck five-cent pieces in steel and plated them with chromium. In 1953 a new five-cent piece bearing the portrait of Queen Elizabeth II was introduced, its shape and metal composition remaining the same as the 1952 issue. 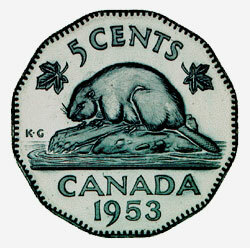 George Kruger-Gray's design featuring a beaver, which had been introduced in 1937, continued to appear on the reverse. Kruger-Gray's initials KG appear to the left of the beaver. The chromium-plated steel five-cent pieces were struck and issued until 1955, when once again nickel was used. The coin featured forms part of the National Currency Collection, Bank of Canada.